Each month, Harvard receives approximately 200 requests from College students wishing to see their admissions files. But some say they're left with more questions than answers. Within the manila folder lay his Harvard application—the essays, transcripts, and standardized test scores that Shane E. Campayne ’19 had labored over since he was a freshman in high school. “Not a lot of it made very much sense to me,” he said. Motivated by curiosity, Campayne had requested to view his admissions records last year. But, after looking at the record presented to him—a page of numbers that didn’t add up and a few sentences of comments—he said he was left disappointed. Each month, the Registrar’s Office receives approximately 200 requests from College students wishing to see their admissions files, according to Michael P. Burke, the registrar for the Faculty of Arts and Sciences. Like Campayne, some say they were just curious. Others say they requested their files to reassure themselves that they belonged at the College. How Harvard decides which of the tens of thousands of high school applicants to admit is not only the subject undergraduate curiosity. An anti-affirmative action group has sued the University, arguing that its admissions processes illegally disadvantages Asian-American applicants. And the Department of Justice is conducting its own investigation into the same allegations. But for some of these students, the scrawls on the single-paper summary provide no clear-cut sense for why they received an offer of admission, leaving them dissatisfied and doubtful. To view their admissions files, student must email the Registrar’s Office to indicate their interest and fill out a form with their name, class year, and House. According to the form, students can expect to wait up to 45 days, the maximum allowed by the Family Educational Rights and Privacy Act. During appointments, students have 45 minutes to read through their files and take notes while a proctor looks on, Burke said. Every student that makes a request sees a summary sheet, comments from two admissions officers assigned to review their file, and their application. If they did not waive FERPA rights when applying to college, they can also see letters of recommendation from their teachers. Director of Admissions Marlyn E. McGrath ’70 first confirmed to The Crimson that students could access their admissions records through the Registrar’s Office in January 2015. While McGrath said students have always had the right to view educational records, including admissions files, the practice gained popularity earlier in 2015 after The New York Times reported a group of students at Stanford University had successfully used FERPA to view their records. In the months that followed, student requests at the College increased from a “handful” a month to 100, Burke said. The Registrar’s Office now receives about 200 requests per month, mostly from freshmen, according to Burke. To handle the demand, the Registrar’s Office assigned an employee to process the requests in 2016, Burke said. For some students, the information provided can raise more questions than answers. In interviews with The Crimson, five students who had viewed their admissions files said they were disappointed at the opacity of the summary sheet, which did not label numerical scores that rated the quality of essays, recommendations, and other material. “They refer to things I didn’t exactly understand, but you’re not really allowed to ask about it so you’re just sort of left to your own,” he added. Harvard acceptance letters are sealed by members of the Office of Admissions and Financial Aid prior to being mailed off. The length and content of comments depend on the individual officers assigned to the file. Three students—Barham, Ben I. Sorkin ’20, and Cora A. Neudeck ’19—said they saw comments about specific grades, work experience, legacy status, and geographic background. Campayne and Sorkin both said they had only seen a few brief remarks, while Barham said he saw multiple paragraphs. Barham said that what he thought would stand out the most in his application did not correspond to what the admissions readers had highlighted. Sorkin said he did not find anything in his file that he had not already guessed. 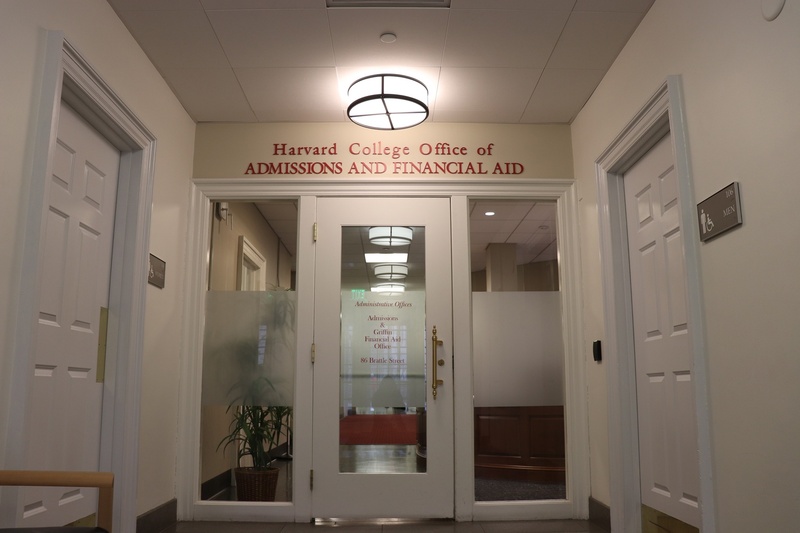 According to McGrath, the information does not give students a full picture of Harvard’s admissions process, which is based primarily around discussion rather than written comments. On its admissions website, Harvard states that its "admissions process enables us to give deliberate and meticulous consideration of each applicant as a whole person" and "considers growth and potential, interests and activities, character and personality, and contribution to the Harvard community." Short of major changes to FERPA or to the admissions process itself, McGrath said that the material available to students will remain the same for the foreseeable future. The lack of clear information ultimately led some students to think about their place at Harvard differently. For some students seeking an explanation for their acceptance letter, the experience turned out more painful than they expected. 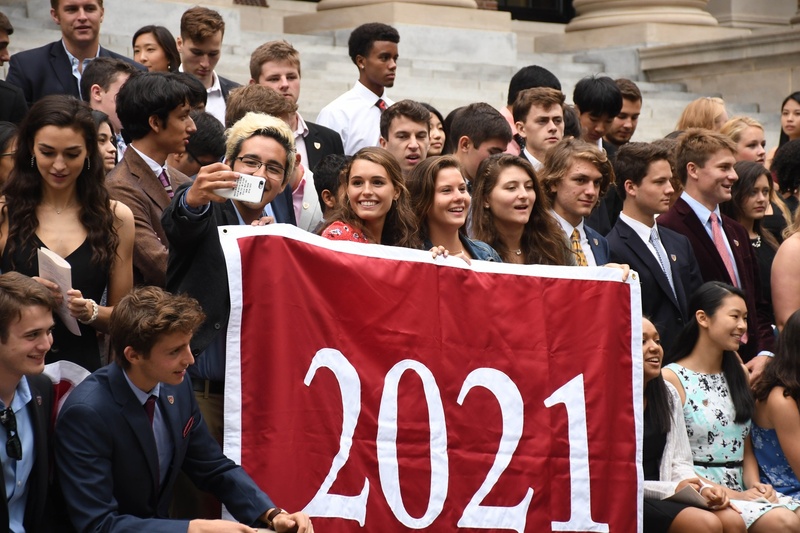 Members of the Class of 2021 gather for their class photo following Freshman Convocation. Katherine M. Vincent ’19, who viewed her file her freshman year, said she did so out of a sense of “impostor syndrome”—the feeling that, deep down, she didn’t really belong at Harvard. Viewing her admissions file, she said, didn’t quite give her the assurance she was looking for. But upon reflection, Vincent said she ultimately realized her experiences at the College matter much more than lingering questions about her admission. Barham said he had too come to terms with his comments.